Based on our new PDFSign .NET signature component, we have implemented the eDocPrintPro signature plugin as the first application. This means that we are now also able to print PDF / A or ZUGFeRD printouts without losing the PDF / A & ZUGFeRD conformity. 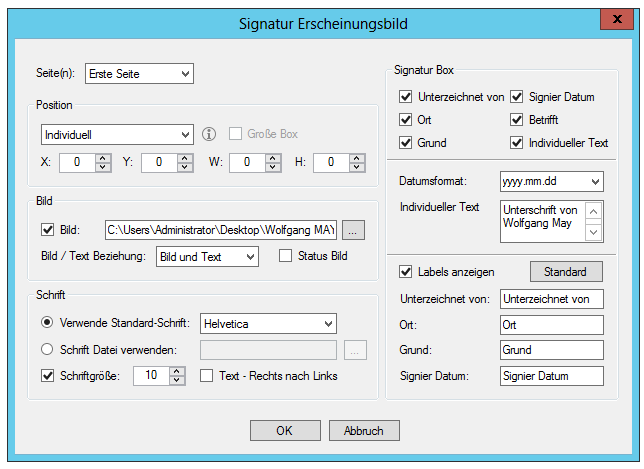 Signing (visible / invisible) of PDF, PDF / A and ZUGFeRD Output as plug-in function for all eDocPrintPro versions. The eDocPrintPro plugin also supports several PDF printers with different settings. 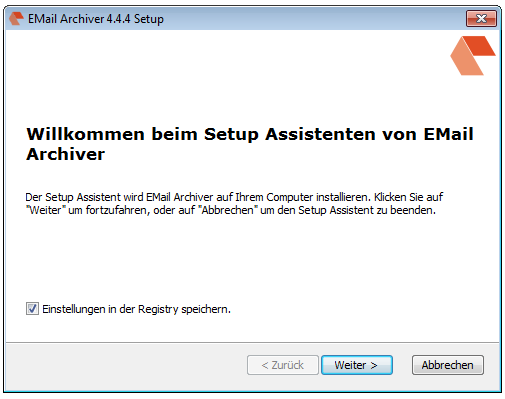 Chained deployment with other plugins possible – The signature is always executed as the last processing step. All settings can be saved and retrieved as PDFSign profiles. Profiles can be preselected or interrogated interactively. PDFSign profiles can be exported or imported as XML (* .psnx) files. Plugin SDK – incl. C # sample project – Available PDFSign profiles can be selected and activated depending on the eDocPrintPro printer. Long and thus more secure keys (SHA512 algorithm and RSA2048) are supported. Function to confirm PDF documents. Visible signature – page, position, image, font, signature box, signature labels – are configurable. Certificate Generator – Allows you to create self-signed software certificates. PDFSign is used to sign PDF documents with an X.509 certificate. In addition to the single signature, larger quantities of documents can also be signed in the stack in a time-saving manner. Since the signing also guarantees that a document has not been changed afterwards, the signing must always be the last step of the document creation. A subsequent change would render the signature invalid. PKI compatibility: PDFSign is completely PKI neutral and works with PKI components from any vendor, including CAs, certificates, CRLs, SmartCards, etc. The access and use of the certificates and associated private keys can be done via SmartCards, USB Token or PFX files. 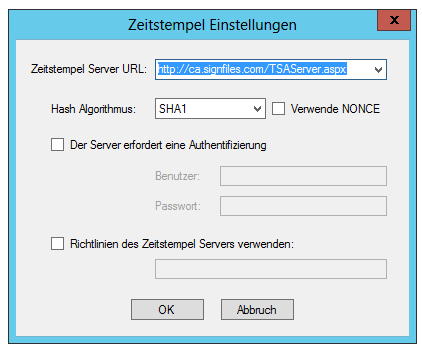 Also, a signature processing is supported via Hardware Security Module (HSM), provided that they have an MS-CAPI or PKCS # 11 interface. 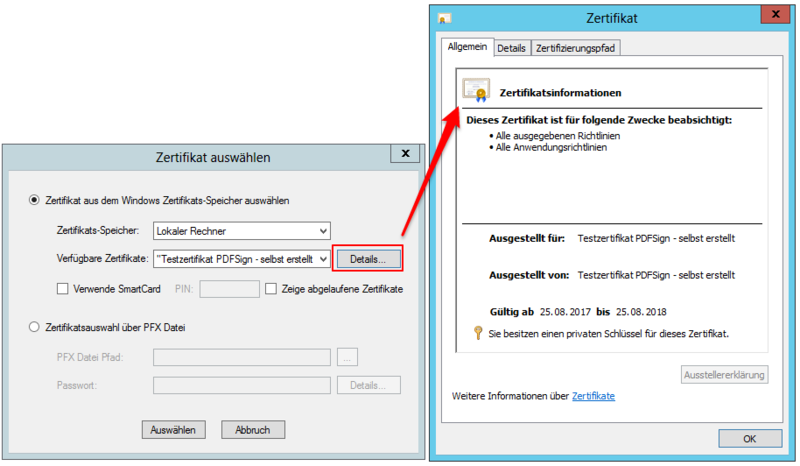 PDF/A or ZUGFERD documents remain valid: PDFSign ensures that the PDF/A or ZUGFeRD compliance is maintained even when applying the (visible) signature. Billing signatures: The PDF / A and ZUGFeRD PDFSign compatible signatures can be used to digitally sign both individual (interactive) and larger quantities (batch processing) of invoices. An EU Directive states that invoices sent electronically by all Member States are to be accepted if the authenticity (origin) and integrity (unalterability) can be ensured. PAdES Standard: PDFSign is compatible with PAdES part 2 and PAdES-LTV (long-term validation) standard. The revocation information of the certificates is embedded (PAdES-LTV). Long-term validation: With PDFSign, a long-term validation document can be signed and stamped with a time stamp. PDFSign supports advanced digital signatures that contain embedded RFC 3161 compliant secure time stamps. Such certificates may also be verified after expiry of the validity and after revocation of the certificate. CAdES-T (time stamp) Support – CMS Advanced Electronic Signature (CAdES) – CAdES-T (Timestamp), inserts trustworthy time stamps to protect against repelability. Signing and verifying very large CAdES signed files (100 MB and more). A time stamp helps to determine whether a document has not been modified after the signature. Like signatures, timestamps are easier to verify if they are associated with a certificate of a trustworthy time stamp instance. SHA256, SHA512 Algorithm and RSA2048: PDFSign also supports the SHA256 and the SHA512 hash algorithm (known as SHA2) as well as RSA2048 as well as longer keys. PDF Document confirmation: This electronic confirmation can be used to indicate that the content of the document has been checked and approved. Signature display configurable: PDFSign offers all possibilities to configure the visual representation of the visibly displayed signature. In addition to a number of parameters, the position as well as the pages – first, last, all – can be defined. X.509 certificates form the basis of a public-key infrastructure (PKI). These are electronic legitimations, issued by a certification body (CA) and linked to a key pair consisting of a private and public key. Digital certificates are typically issued by a trusted and certified institution (CA) that guarantees identity. These are delivered both on secure hardware such as SmartCard’s or USB token or as software certificates. 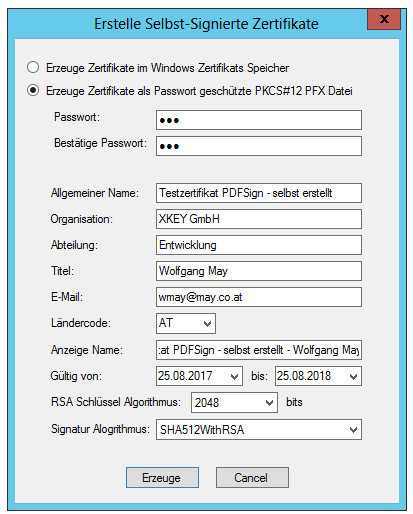 With PDFSign it is also possible to create self-signed certificates. These can be used exactly as official certificates, but they do not have any certification or assurance. Signed documents are technically equivalent could be rejected by third parties but not as trustworthy and reliable. Self-signed certificates, root or user certificates can be created and stored either in the Microsoft certificate store or as a PFX file. SHA 256, SHA 512, RSA 2048, RSA 4096 Algorithms and key lengths can be used. 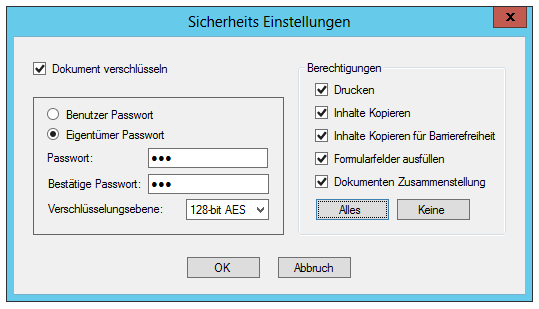 Key usage and extended key usage can be easily configured. X.509 Certificates and their properties can be displayed. 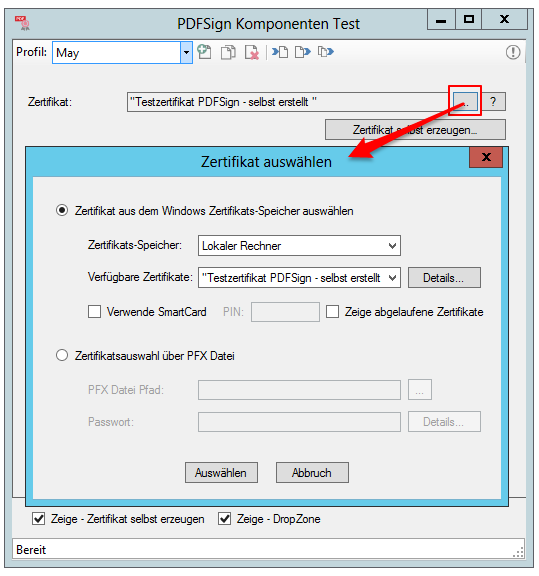 PDFSign .NET component: The PDFSign .NET component can be used to develop Windows Server and desktop applications. Windows 7 or higher, including Windows Server 2012/2016 and Windows 10. PDFSign .NET component requires .NET Framework 3.5 or higher. 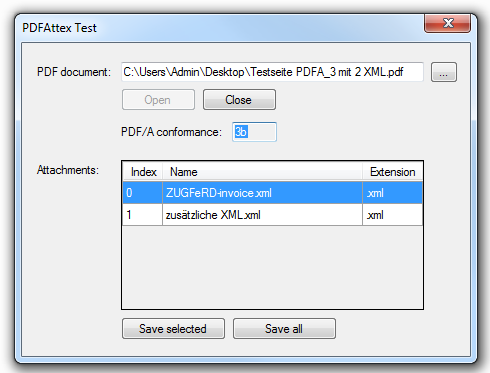 PDF, PDF / A-3 as well as the ZUGFeRD format make it possible to use PDF documents as containers to embed any files into the PDF. The recipient needs a way to extract the embedded files. This can be done interactively, eg. through the Adobe Reader. However, if you want to automate this process, you need an appropriate software component, which can be integrated into an application to read and save the attachments. For the ZUGFeRD format, there is a free CommandLineTool – ExtractZUGFeRD-XML as well as a .NET / COM component with PDFAttex. This is now included as an extension in the eDocPrintPro SDK. VisualBasic6 (VB6) requires, for example, a 32bit component.By default, VB can not deal with .NET components created for a mixed-32 / 64bit environment. 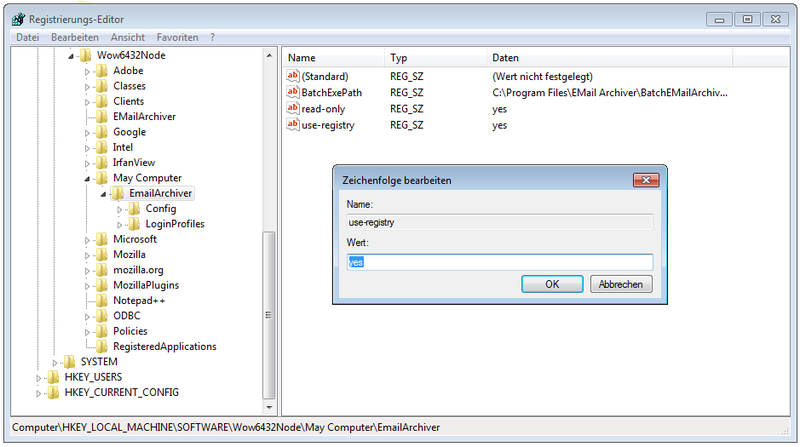 Therefore, we provide a 32bit variant of the DLL. To be able to be addressed, this DLL must first be registered with the 32bit RegAsm.exe from .NET 2.0. For this, the following command should be executed as an administrator via a CMD file: “C:\Users\Admin\Desktop\VB Sample\RegAsm.exe” “C:\Users\Admin\Desktop\VB Sample\PDFAttex.dll” /codebase. Then, in VisualBasic, the component is available in the list of existing references and can be used. 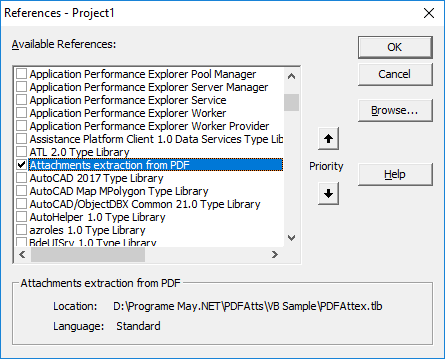 PDFAttex is part of the eDocPrintPro SDK and requires .NET Runtime version 2.0.